Welcome to PRICE CARBON NOW! | PRICE CARBON NOW! Let’s price carbon effectively in Saskatchewan! It is widely agreed among economists that carbon pricing is a market-based, cost-effective way of reducing greenhouse gases. Saskatchewan’s Premier Brad Wall has ruled out introducing carbon pricing in the province citing potential adverse impact to the economy. He said a $15 per tonne carbon price would cost the province’s economy $500 million a year. He has also indicated that that is better to invest in clean technology such as carbon storage and capture than price carbon to reduce GHG emissions. Does carbon pricing affect economy negatively? There are several studies of real world examples that suggest that carbon pricing doesn’t negatively affect the economy. British Columbia has had a revenue-neutral carbon tax since 2008 that was combined with income and corporate tax cuts. Between 2008 and 2013, while Canada’s real annual GDP grew by 0.4%, British Columbia’s grew by 0.5%. As a result of recycling of the carbon tax revenues, household welfare in the province were relatively unaffected (Beck 2015) as was the province’s economic growth (Metcalfe 2015). In terms of employment, while some industries (emissions intensive, trade exposed industries) experienced negative employment effects, there were positive effects for the overall labour market (Yamazaki 2015). In 2009, ten Northeastern and Mid-Atlantic states in the US introduced the Regional Greenhouse Gas Initiative (RGGI), the country’s first cap and trade program for GHGs. An analysis of the economic impact between 2012 and 2014 indicated the program resulted in $1.3 billion of economic value to the RGGI states. The program also offset the impact of increased electricity prices through local reinvestment in energy efficiency and renewable energy programs. Overall, consumers including households, businesses, etc. experienced a net gain of $460 million because of overall decrease in energy bills over time. Saskatchewan has the highest emissions intensity and per capita emissions in the country with numbers that are three-times the national average. 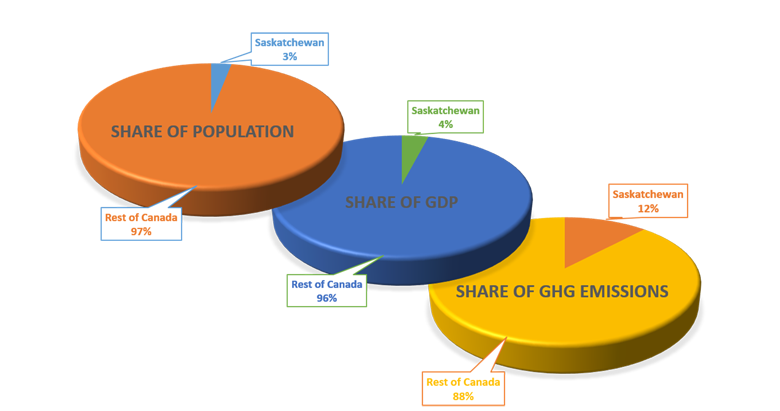 The province has 3% of Canada’s population, 4% of the country’s GDP, yet 11% of the country’s GHG emissions. A broad (covering most, if not all, emitters) and effective (designed to achieve meaningful reductions in emissions) carbon price is a market-based and cost-effective way of reducing emissions. If designed properly, it could improve the economy in the long-run. And, soon, most of the large provinces will be under some form of carbon pricing including British Columbia, Alberta, Manitoba, Ontario and Quebec. Several conservative leaders have endorsed carbon taxes. This includes Preston Manning and Michael Chong in Canada. Mr. Chong said that we need to have a debate on carbon pricing in Canada. At the 2016 Manning Centre’s conservative conference, he said “[Conservatives] believe that externalities should be priced and that the root of what it means to be conservative is to conserve our environment for future generations." In Ontario, the Progressive Conservative leader, Patrick Brown has expressed support for a revenue-neutral carbon tax in the province. So, let’s price carbon effectively in Saskatchewan!